In what is being considered to be one of the biggest free events in Malta, Crossroads@Zabbar will feature some of Malta’s best acts in three separate, but close, venues. This event, which is fit for all ages, is being held in three different venues which stem from Zabbars’ crossroads found in the city’s main street. 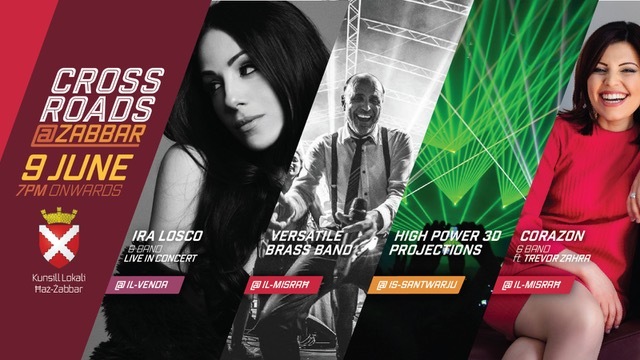 The square known as il-Venda will feature one of the biggest names in Malta’s rock scene, Ira Losco & Band live in concert. Inevitably the concert, featuring some of her chart-topping singles, will be one to remember. The renowned facade of the Sanctuary of Our Lady of Graces will shine like never before through an audio-visual show and animated 3D high power projections. A number of high power projectors, brought to Malta specifically for the event, will bring the facade to life during four shows held at different times throughout the night. Not to be missed! The third venue, the historical square known as il-Misraħ will offer a typical Maltese night starring local personality Corazon who will perform with her band along with Maltese renowned author Trevor Zahra. Everyone is invited to close the night off at il-Misraħ to the vibes of one of the islands’ top brass bands – Versatile Brass Band and a firework show. Various food stalls and bars will be available in the locations, with other entertainment offered in between. Whatever your tastes, Crossroads @ Zabbar is an event you wouldn’t like to miss!